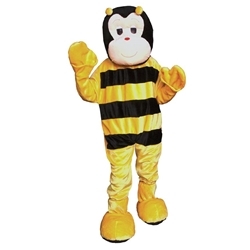 Bumble Bee Adult Costume includes a jumpsuit with attached mitts, character head with matching feet. One size fits most. Height up to 75 inches, waist size up to 60 inches. Machine wash gentle. Flame retardant. Polyester.